Bill of our North Aurora, Illinois, pet center had the opportunity to attend a recent Chamber of Commerce State of the Mayor's address. While Bill was mingling, he gave some knowledgeable, neighborly and pet-centric advice about feeding freeze dried food to dogs. A few days later, he got this wonderful letter from a fellow chamber member. What a great way to build neighborly connections and support the North Aurora community! But per your advice I now add water and they can’t wait for feeding time. Thank you so much for the advice and I am so pleased with the way my girls eat their food once again. As I told you I also feed the kibbles to them as well, so they are getting a mix of the freeze dried and the kibbles. 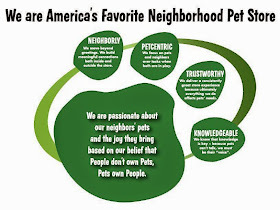 Again thank you so very much for your information, and I just want to let you know that Pet Supplies Plus should be very honored to have such a dedicated employee in you and your commitment to North Aurora. I look forward to chatting again soon with you. Thanks a million, and make it a great day!